Remove dataloading.net redirect virus, which hijacks Safari and other web browsers on Mac OS X to intercept one’s Internet traffic and support rogue services. The swindlers behind the dataloading.net browser hijacking campaign are mixing the use of malicious code with a fair degree of bluff. This stratagem is a type of tech support scam backed by a piece of Mac malware that affects Safari and possibly other browsers, including Chrome and Firefox. The main symptom that the victims are confronted with is that every time they try to visit a web page, their online activity gets rerouted via dataloading.net proper or dataloading.net/j/pne. This adverse effect applies to the cases when people open a new tab, do a web search, or simply launch their default browser. This predicament can be reportedly also accompanied by a few more domains, such as gstatic.com, ssp.zryydi.com and xml.yeesshh.com. Most of the time, the destination page is pcmethodsteadfastcloud.online, albeit the URLs may vary as the scam campaign moves on. The alert that shows up in the browser in the course of this compromise may deceive the user into thinking that their computer has been blocked due to suspicious activity or some bizarre error like “# 268D#3#” or similar. According to the fake warning, the machine is infected with a virus or spyware, which may purportedly steal the victim’s credit card details, Facebook login data and other personally identifiable information. The message also recommends the user not to close the page and call the impostors at a toll free phone number for pseudo troubleshooting. In fact, though, the Mac is not blocked and the only infection on board is dataloading.net itself. This is nothing but a tactic aimed at persuading gullible people into calling the criminals, who will then attempt to get hold of sensitive data or demand a payment to proceed. The malware that sustains redirects to dataloading.net and its satellite domains infiltrates Macs in a stealthy way. The most likely entry point is a bundled software installation. This is a social engineering technique that allows cybercrooks to distribute perpetrating applications under the guise of harmless program setups. Therefore, when installing something, especially freeware, be sure to deselect every single extra offer that comes as part of the default preset. If the dataloading.net virus is inside and wreaking havoc with Internet browsers on Mac OS X, the steps below will do the trick cleaning up the system and reinstating the right web surfing parameters. When confronted with malicious code like the Dataloading.net virus tech support scam on Mac, you can neutralize its toxic impact by leveraging a specially crafted system utility. The Freshmac application (read review) is a perfect match for this purpose as it delivers essential security features along with must-have modules for Mac optimization. This tool cleans unneeded applications and persistent malware in one click. It also protects your privacy by eliminating tracking cookies, frees up disk space, and manages startup apps to decrease boot time. On top of that, it boasts 24/7 tech support. The following steps will walk you through automatic removal of the Dataloading.net virus infection. 4. Check whether the Dataloading.net virus has been fixed. If the lock screen is still there, go to the Uninstaller option on Freshmac GUI. Locate an entry that appears suspicious, select it and click Fix Safely button to force-uninstall the unwanted application. 5. Go to Temp and Startup Apps panes on the interface and have all redundant or suspicious items eliminated as well. 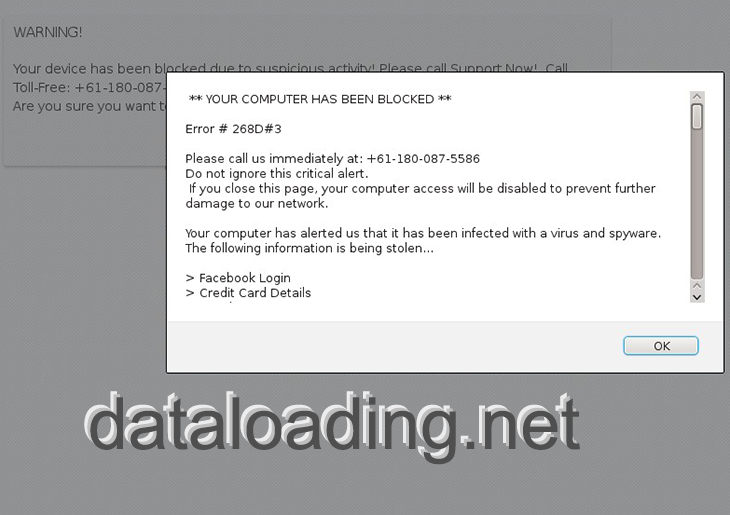 The Dataloading.net redirect virus fraud shouldn’t be causing any further trouble.